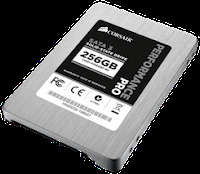 If you're looking for a SSD to speed up your system, Corsair brings yet another option to the table with their new range of Performance Pro SSDs, with Marvell 6Gb/s controllers promising 515/440 MB/s of read/write speeds. And you don't even have to worry about manual "trim" operations (to restore the drive performance to its original levels by marking unused blocks as empty), as Corsair has implemented a auto-trim function so you can rest assured your drive is always in top-shape, even if it's "hidden" behind an otherwise impassable RAID controller. Prices start at $280 for the 128GB version, and be sure you have a 6Gbps SATA motherboard before you consider going the extra mile for these kind of speeds.